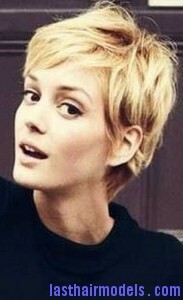 A messy pixie hairstyle can give a little hard look when compared to the standard pixie style. There will be bangs framing in front the face and covering the nape. There are many celebrities who like to style their hair in this manner if they want to keep their hair short. Just follow this simple method to create this style at home without going to hairstylist. It is easy to get this hairstyle, first wash your hair and brush it completely. Then cut your hair near the nape of the neck and use a comb as your guide. 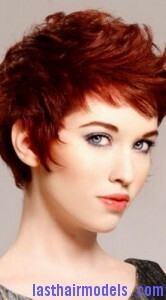 Now cut the hair about two inches around the entire head to create a base for this hairstyle. 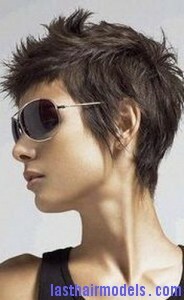 Try to razor cut the ends of your hair both at the right and left side of the head. Next blow dry your hair fully without using any hair products. Add a quarter-sized dollop of mousse in your fingertips and apply it over your hair to style small chunks of hair for achieving a piecey, wind-swept look. Avoid forcing the hair to fall into place as it can detract from the messy look. Take a few pieces of hair to make it fall on your natural hair part and it make sure it hangs over your ears as well as forehead. At last mist all over the hair with a little amount of hairspray to keep the hair in place and get into your desired look.